Laser skin resurfacing treatments can help keep you looking and feeling youthful with smother, fresher looking skin with improved tone and texture, reduced wrinkles around the eyes, and improved appearance of some scars. The effects of sun, pollution, stress and fatigue can all impact the overall look and feel of your skin. Laser skin resurfacing treatment can help improve these effects. The laser treatment targets aging and sun damaged skin by safely penetrating the skin’s deeper layers and stimulating the body’s own natural healing process to create new collagen. Old and damaged cells are replaced with fresh, glowing, healthy skin. You see results right away and also progressively. Soon after the treatment, skin often feels softer and smoother with a more even tone. Then in the following months, more improvement will occur a sthe deeper layers of the skin continue to create new collagen. Results are long lasting depending on your lifestyle, age, skin condition and skin care routine. Desired outcomes are typically reached in multiple treatments. In a comprehensive consultation, our providers will discuss a treatment plan tailored to your goals, lifestyle and preferred downtime. 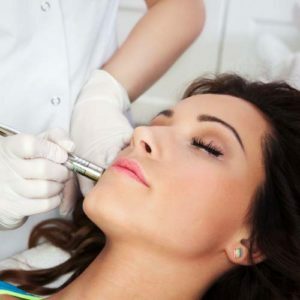 At the Facial Plastic Surgery and Rejuvenation Center, we have several different laser options to meet your specific needs.